among the first British soldiers to liberate Bergen-Belsen in 1945. I can give no adequate description of the Horror Camp in which my men and myself were to spend the next month of our lives. It was just a barren wilderness, as bare as a chicken run. Corpses lay everywhere, some in huge piles, sometimes they lay singly or in pairs where they had fallen. It took a little time to get used to seeing men women and children collapse as you walked by them and to restrain oneself from going to their assistance. One had to get used early to the idea that the individual just did not count. One knew that five hundred a day were dying and that five hundred a day were going on dying for weeks before anything we could do would have the slightest effect. It was, however, not easy to watch a child choking to death from diptheria when you knew a tracheotomy and nursing would save it, one saw women drowning in their own vomit because they were too weak to turn over, and men eating worms as they clutched a half loaf of bread purely because they had to eat worms to live and now could scarcely tell the difference. Piles of corpses, naked and obscene, with a woman too weak to stand proping herself against them as she cooked the food we had given her over an open fire; men and women crouching down just anywhere in the open relieving themselves of the dysentary which was scouring their bowels, a woman standing stark naked washing herself with some issue soap in water from a tank in which the remains of a child floated. It was shortly after the British Red Cross arrived, though it may have no connection, that a very large quantity of lipstick arrived. This was not at all what we men wanted, we were screaming for hundreds and thousands of other things and I don't know who asked for lipstick. I wish so much that I could discover who did it, it was the action of genius, sheer unadulterated brilliance. 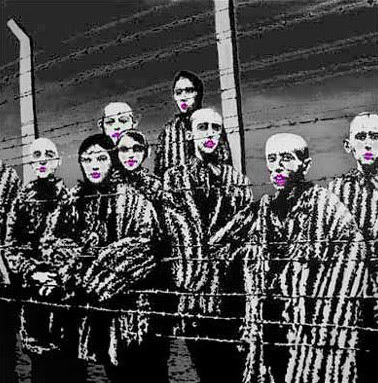 I believe nothing did more for these internees than the lipstick. Women lay in bed with no sheets and no nightie but with scarlet red lips, you saw them wandering about with nothing but a blanket over their shoulders, but with scarlet red lips. I saw a woman dead on the post mortem table and clutched in her hand was a piece of lipstick. At last someone had done something to make them individuals again, they were someone, no longer merely the number tatooed on the arm. At last they could take an interest in their appearance. That lipstick started to give them back their humanity." Have to say .....what a pile of old shite....! whats your name, Stevie Wonder ? I remember that save he made against Pele in the World Cup...brilliant! mate you haven't got a clue. I'm sure the survivors of Bergen-Belsen would appreciate this "art". When someone has no talent all that is left is the ability to provoke for provocation's sake. 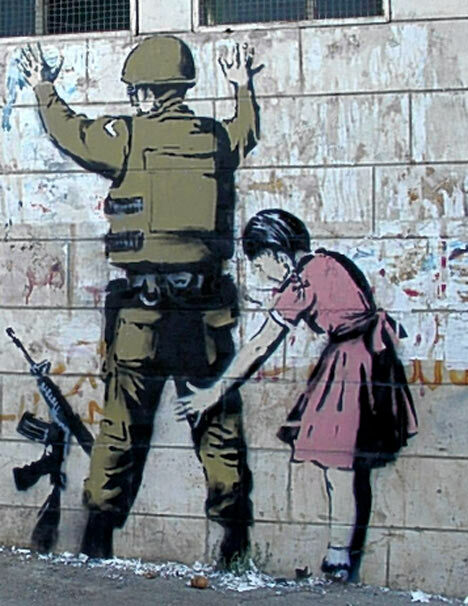 I heard Banksy is some public school educated toff btw. which is pretty much what banksy would say. his background is irrelevant though, he's an artist.....they are all nuts, if he wants to spread word that he is a street urchin who cares if he isnt.